You can use this night plan data any how you like, you can stream videos online, download and do a lot of things, it also support all phone like, Android , blackberry, IOS and many more BUT the data only last for one Night which is still OK for that price. 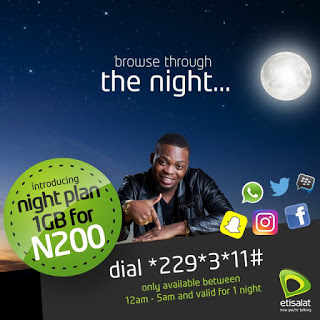 Make sure you have upto N200 on your phone to be able to make use of that Night plan…. Dial *229*3*11# and you will be welcomed to the plan.